Nine, 18 or 36 holes of stroke play in various divisions. 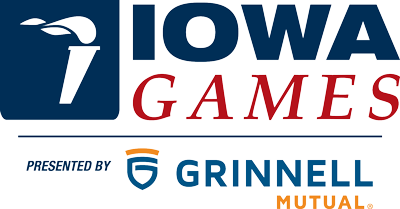 Those divisions playing 36 holes will play 18 holes at Carroll Marty Disc Golf Course at Gateway Park and 18 holes at the Iowa State University Disc Golf Course. Medals awarded to three lowest scores in each division. Ties for medals will be broken by sudden death play-off. Current PDGA Rules shall govern play. Athletes must provide their own PDGA-approved discs. Athletes will receive a colored T-shirt for their entry fee. Pre-registered athletes may upgrade their cotton shirt for a dri-fit for an additional $10 through June 24. T-shirt pick up will be located indoors at the Sukup South Endzone at Jack Trice Stadium. Access to Sukup Endzone is from University Boulevard. Gold, Silver, and Bronze medals will be awarded in each division. On-site registrations will be accepted until one hour prior to start of competition.